...wherein I do the same scene three ways. Sally Russick of Studio Sublime has challenged us to "Create Art." I took this opportunity to try my hand at watercolors for the first time in oh.... too many years. For a while, I have wanted to create art based on a sunrise or sunset. I have captured several sunrises with my camera, but that didn't quite portray the experience the way I wanted to. I wanted to show what was in my mind's eye, not the camera's eye. I played around with my photo. But that was not quite what I wanted to do, I wanted to paint. I tried colored pencil, because I couldn't find any watercolors. But I knew I had to do my final piece as a painting. 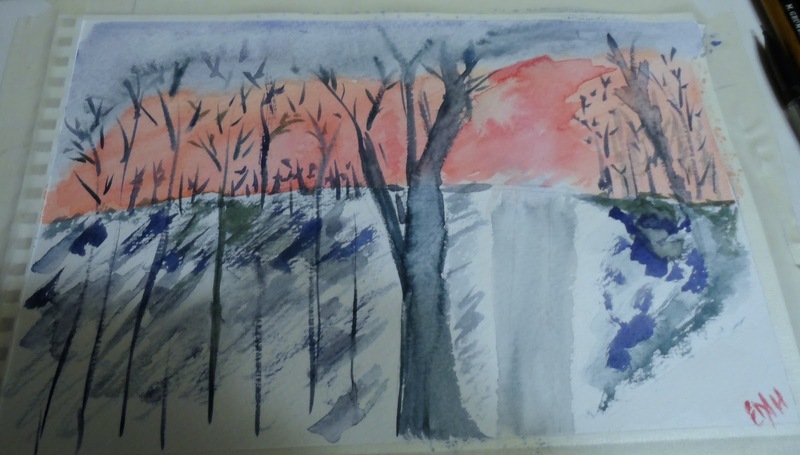 Fortunately I knew I could borrow some watercolors from my daughter. But wait. 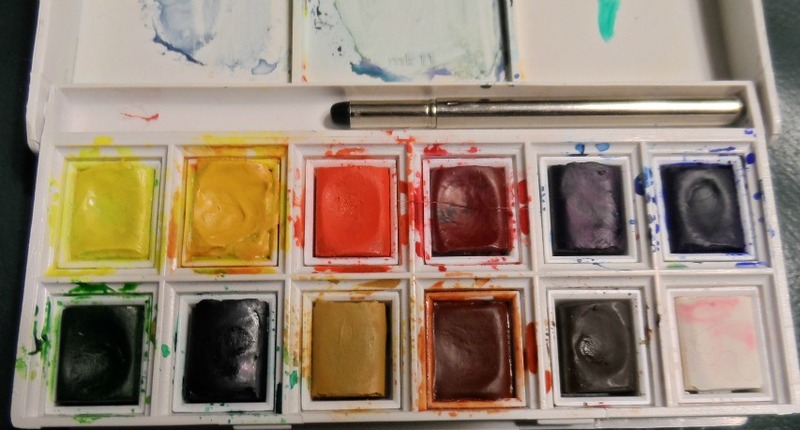 Her watercolor set HAS NO BLACK!!!! Do you see my photo? Do you see my colored pencil sketch? After a bit of back and forth, I settled on using a dark blue instead of black. As I painted, I felt better and better about that choice. After all, I did not want a photographic representation. I wanted a painting! In the end, I am pleased with my choice, and pleased with the medium. To see some of the other replies to this challenge, visit Sally's blog. I love all 3 renditions! And, the fact that you pushed yourself until it was "right for you"! you shared the process beautifully. I think you made great decisions and have some excellent work to show for it. Beautiful painting. Love seeing your process. Very cool to see how you got into your real "mind's eye" point of view. Love the watercolor best!! What a gorgeous sunset!! You captured it perfectly! Thanks for the comment. I love the quote. How very apt! So nicely done! and like all the great 'masters' they paint the same subject multiple times until they get the effect they want. Wonderful journey to your final painting! There is something so special about sunsets (and sunrises). That blaze of color and glory at the edges of the day. I know exactly what you mean about being unable to capture it with the camera. Painting is so much more emotional a connection. I can feel your passion in your process. Karen you hit it. 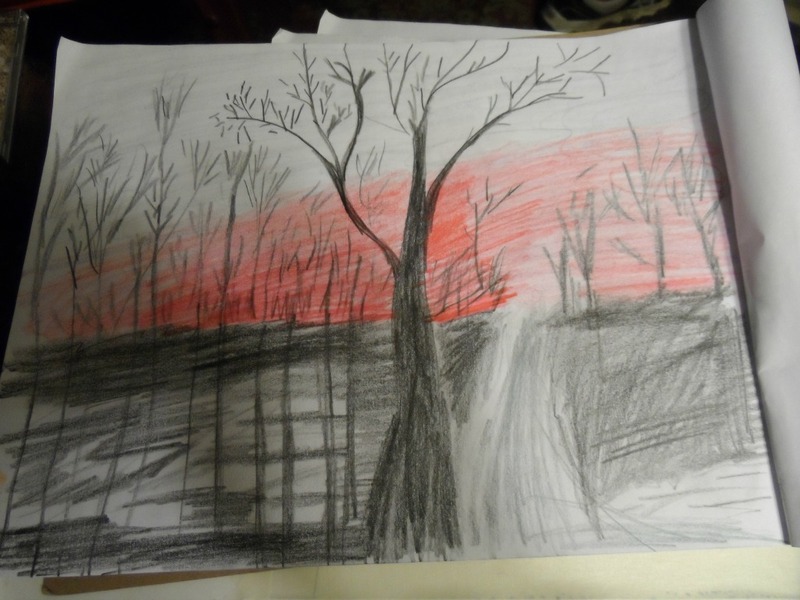 My daughter, who is an accomplished artist, had to "school" me in how to create black. As I thought about it later, I realized that if there had been a black cake in the box, it would no doubt have broken down into other colors in the presence of water. Very cool seeing the process through to the finished piece. I love water colors! Your pencil drawing and watercolor painting are both beautiful. The representation is amazing. The colors are wonderful with the stripe of red and the blues. Very nice Beti, I love the end result with the water colors and your choice of using the dark blue. I love your artwork - how very talented you are!! The colors are wonderful as well. Lovely photos, too! I love the original photo, and even more that you took it to a new level with colored pencils and paint.And the end result is great!! I've always wanted to paint, but somehow it always turns out a muddy mess. Your watercolor painting is lovely. You nailed it so I think you should persue this medium! Sunsets are my favorite thing to photograph but watercolor scares the heck out of me! What a beautiful painting! I think watercolor is such a hard medium to master. The blue worked marvelously and may I even venture to say probably much better than black? I enjoyed seeing the process of how you brought your painting to life. Nicely done! Sounds like you had a great time creating your painting. I enjoyed your description of your process. You are so inspiring to keep going until you created what was in your mind's eye. And it is beautiful! Incredible photos you took of the sunset. Just gorgeous. And you were right to try watercolors instead of pencil. It turned out great! OK, let's try this again and see if I can spell this time....Very nice, Beti! I envy you folks who can...you know...draw! Let alone paint! Lovely job. Don't worry about the spelling! it's all good! I can't stop taking pictures of sunrises, sunsets, and rays of sunlight escaping the clouds. Your drawings/paintings are as beautiful as the photo that inspired them! I have lots of sunset pics also. Living in the country my sunset pics are across an open field and I get to really appreciate mother nature.I think you did very well at creating art. Sally seems to prompt us to do things that we have put off. I'm glad you got to enjoy watercolor again. I am not a painter or a drawer either. I admire those of you who can. Your watercolor is beautiful. The set not having black just forced you to "think creatively" about color! You succeeded brilliantly. You are an inspiration for taking that next step. Love how you went through the process from photo to pencil and finally paint. All thre are wonderful. You did beautiful work and I have to tell you, I've been a watercolorist for many, many years and have NEVER used black watercolor paint. Much more beautiful dark shades can be reached doing exactly what you did. So...bravo! Yeah, I think that my inexperience really shows here. Great job on both...the colors look great too! I loved all the 3 pictures! What a lovely photo it is!! And your palette is equally beautiful!! A very crisp explanation of the process too. 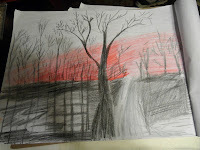 Beti, I love the photos of the sun setting and your pencil sketch, but your watercolor really draws me in, it is beautiful!! I find it funny that if you look at the photos, pencil sketch and watercolor my eye is drawn to a different area of the photo! 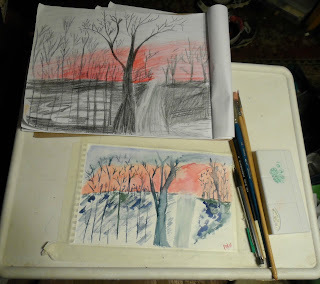 In the photo my eye is drawn to the sunset in it's pretty pinks, but you must of been feeling a strong urge to get your mind's eye perspective across because my eye is drawn to the beautiful strong, beautiful curve of the tree in the pencil sketch and watercolor! Your mixing of "black" is beautiful!